Mark was sick. We’re not sure why he was sick and I wasn’t, since we were eating exactly the same food, but luckily I only had a touch of upset stomach. 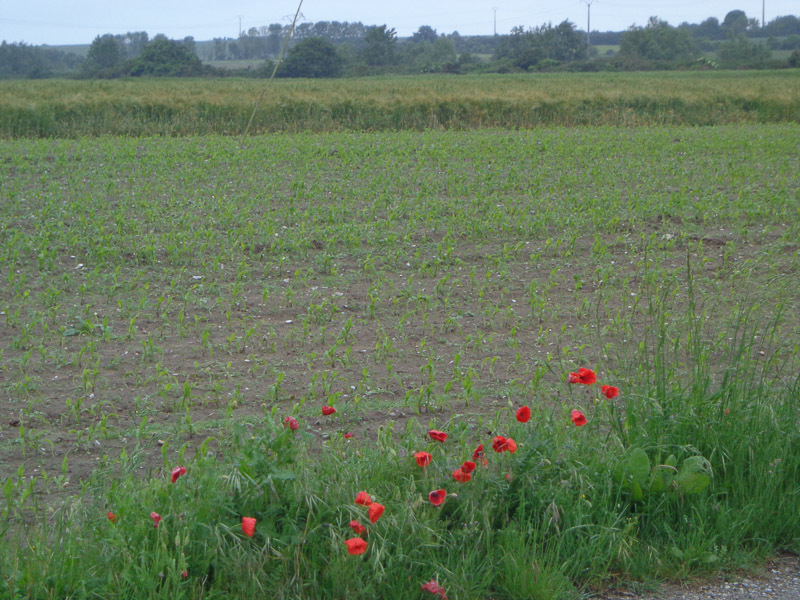 After spending another cold, miserable morning breaking camp in bone-chilling mist, we set out for Boulogne-sur-Mer. This is a touristy, seaside town that boasts a well-known aquarium, as well as the requisite castle, churches, and quaint, cobblestoned old town within fortification walls. But all we were interested in was a hotel. Four solid walls. A real bed. A stunningly hot shower. 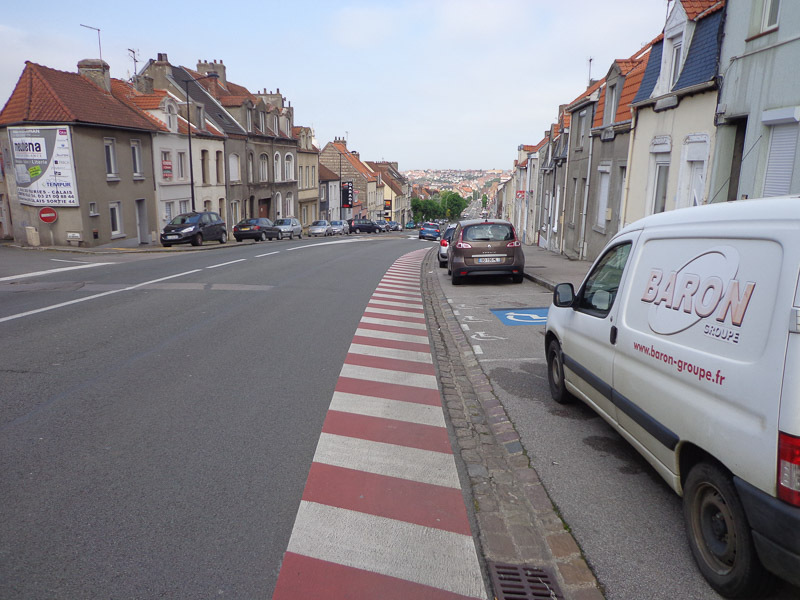 We’d found the TI staff in Abbeville so helpful a few days earlier that we decided to go straight to the TI office in Boulogne and ask them to help us find accommodations. Future baguettes? Too early to tell. 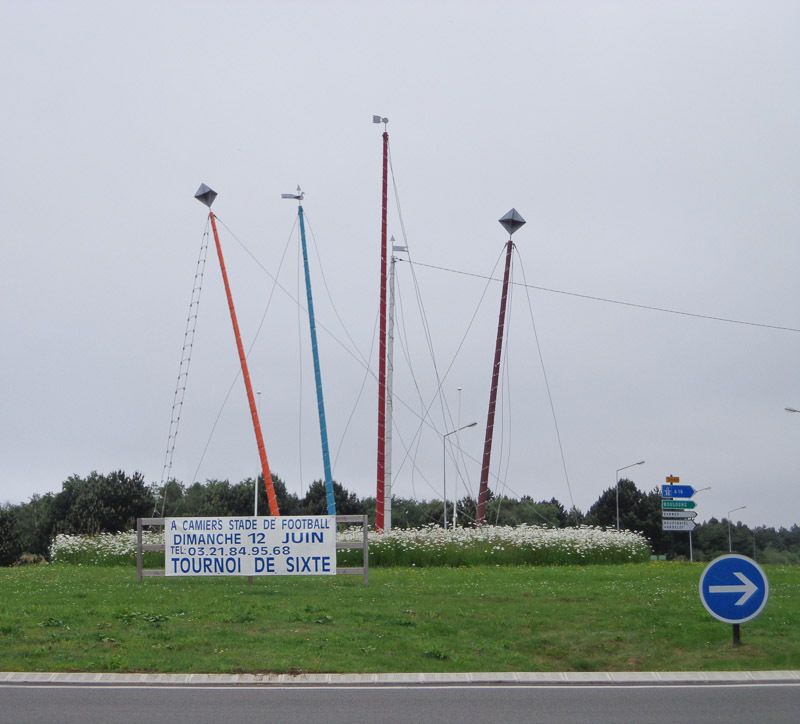 We’ve seen some of the most interesting traffic circles here in France. This one has a vaguely nautical or kite flying theme. Flowers everywhere in France. 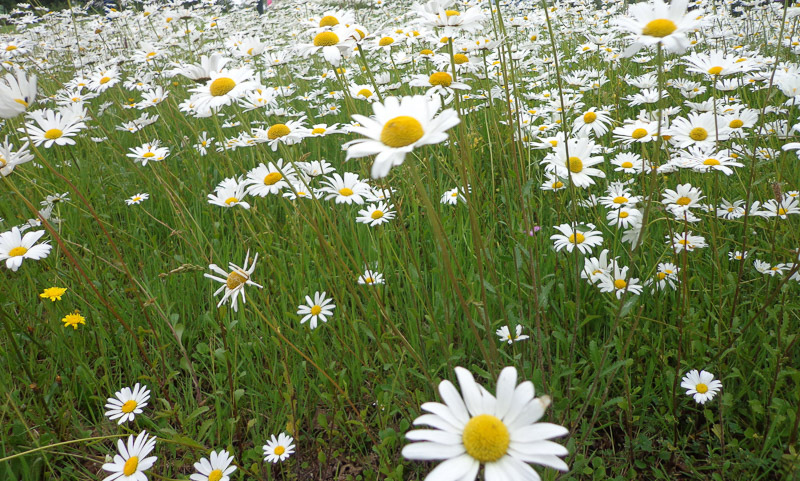 Can you believe this is a traffic median? 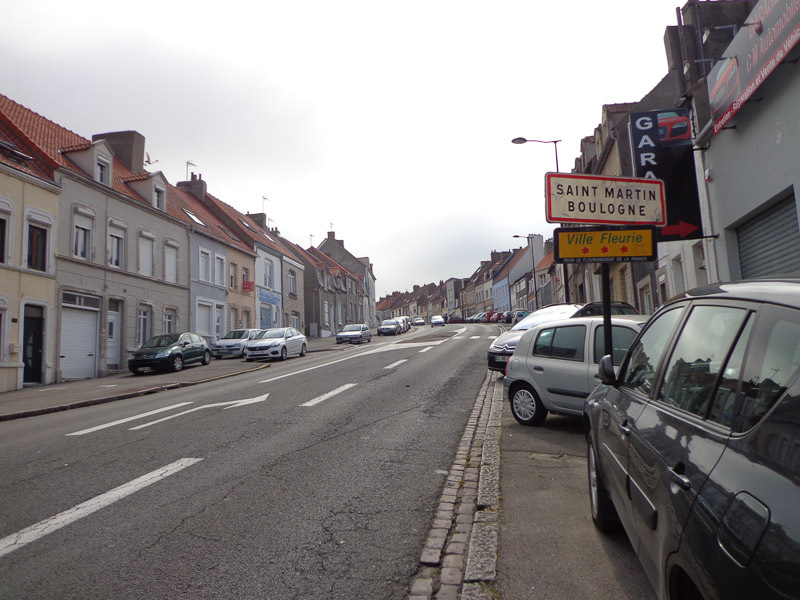 We straggled into Boulogne and found the TI office on the far end of town. We locked up our bikes outside and happily noted the “WiFi Gratuit” (free wifi) sign on the door as we entered. As soon as we walked in, however, we noted a decidedly different ambiance at this TI office than the one in Abbeville. First, it was small and cramped, with no chairs, table, or counter space for customers. And the staff barely acknowledged our presence as we walked in. Mark, feeling decidedly ill after cycling nearly 35 km, had no option but to lay down on the floor against a back wall. I found a tall stool hidden behind a rack of tourist brochures, pulled out the laptop, and connected to the TI wifi. As advertised, the wifi was free…for 15 minutes only! Trying to make the most of my 15 minutes, I searched some or our common hotel websites: Booking.com, Hotels.com, Trip Advisor, etc. What we didn’t account for when we made our grand plan that morning is that this is Saturday. The Weekend. Everything was either sold out or expensive. Even the Ibis, somewhere between Motel 6 and Holiday Inn Express, cost nearly €100 per night. Paying that for one night would be bad enough, but we were looking to stay for a few days to wait out the weather and for Mark to feel better. I found some potentially inexpensive B&B options on Trip Advisor, but when I tried calling, most people didn’t speak English. I asked the TI employee if he knew any of the B&Bs, and he said he was only familiar with two. He called those two, but one didn’t answer the phone and the other was booked. I asked him to call the others to ask about their availability on my behalf, but he refused! He is only allowed to interact with “partner” accommodations (e.g., accommodations that pay to be listed at the TI office). I finally convinced him to call the youth hostel for us. He reported back that it, too, was sold out. Left to my own devices, I continuing searching the web on my own, and found a motel chain called B&B Hotels that appeared to have inexpensive rooms: only 55€/night (not including breakfast, despite the name). The TI clerk deigned to tell me that it was 5 km out of the city center, and showed me where it was on a map. Well, 5 km isn’t far (3 miles). While not as ideal as being centrally located, Mark indicated that he had a few km left in him. And so, I made the non-refundable online reservation. What the TI clerk failed to tell us is that the hotel is in the next town over, and uphill! And not just a slight grade, but STEEP!!! The clerk saw Mark laying on the floor, feeling decidedly unwell. He saw our loaded bicycles parked right outside the plate glass window. He saw that we were tired and cold. And he failed to mention it. Thanks buddy! Still only halfway up to the motel, looking down at where we’d come. Remember: we started at the beach, which is even lower than the buildings on the horizon. The road to the motel was so steep that we had to get off and walk. Even had Mark been feeling in tip-top shape, I still think we’d have had to push our bikes up that climb. We finally arrived at our accommodations and found it was another motel next to another McDonalds. I was so disappointed. I really wanted to be in a centrally located hotel – even a divey one! – where we could finally see some of the sights and I, at least, could get a nice meal rather than cooking up another cowboy dinner. Instead, we were in the periphery, at the tippy top of a hill, with nothing but chain restaurants around us. But, it was four solid walls, a real bed, and stunningly hot water. Now that we were finally here, Mark didn’t care where it was, what restaurants did or didn’t exist nearby, or even how divey it might be. 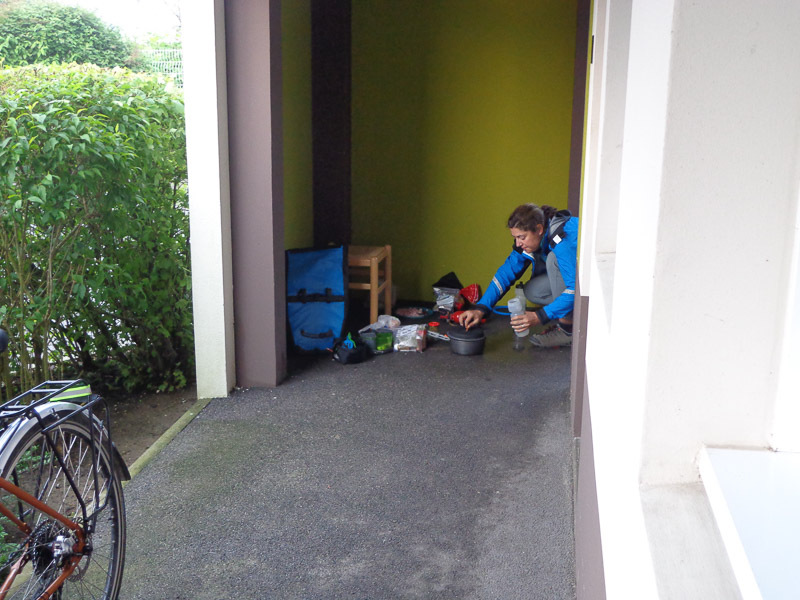 I took advantage of the covered walkway outside our motel room to lock our bikes up mostly out of the rain and to make myself some cowboy pasta for dinner. Then I made a reservation at the youth hostel for the following night…and found that they weren’t sold out tonight after all! Damn that TI clerk!!! On Sunday, after a warm, dry, and solid night’s sleep, Mark was feeling considerably better, although still moving pretty slowly. We finally got the bikes loaded up and then careened about 2/3rds back down the hillside to the fortified old town. We found the cathedral, and being Sunday, mass was taking place. Just past the side entrance to the cathedral, we saw an enclosed cloister garden nestled into a niche in the side of the church. 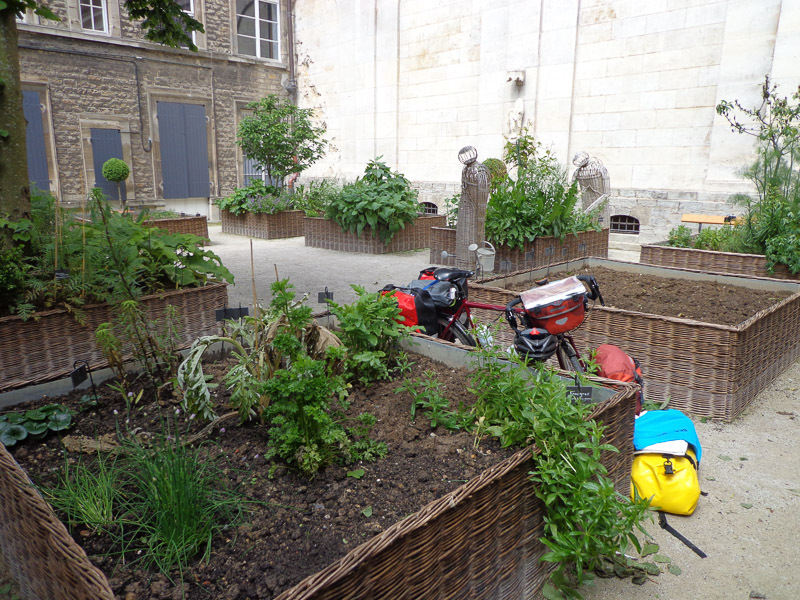 It was primarily an herb garden, with several large planter boxes in the center and long benches around the perimeter. I recognized cilantro, chives, parsley, oregano, fennel, and sage, among many other edible plants. 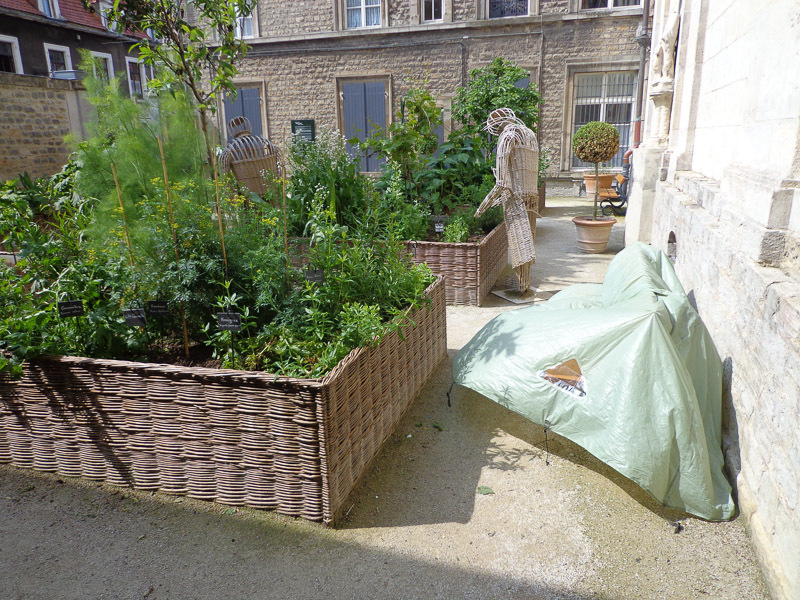 We had the entire garden to ourselves (although we refrained from helping ourselves to the herbs). Hidden behind the cathedral’s walls, people didn’t seem to know it was there. The sun was peaking out, so we decided this would be a great place to finally dry out our tent after being packed away wet several days in a row. 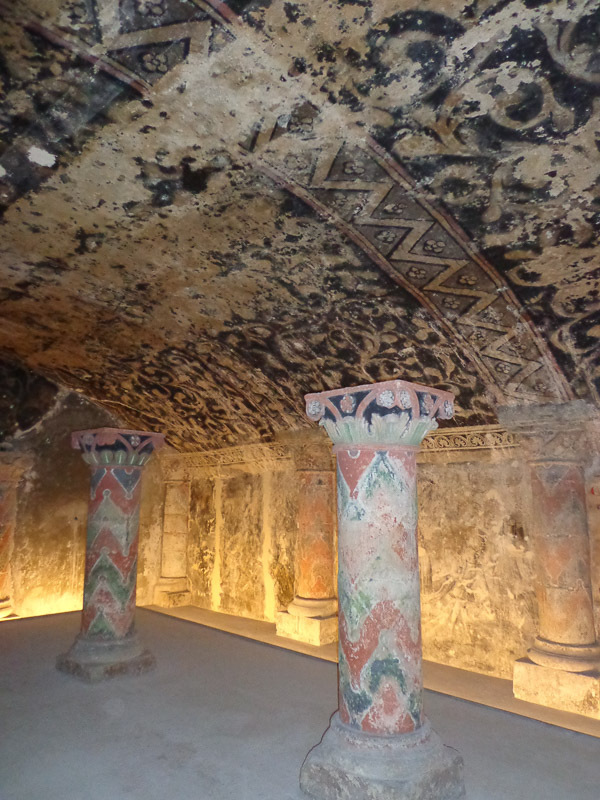 We draped the tent on over one of the bicycles and the fly over a bench, and then each took a quick turn visiting the cathedral’s famous crypt (free on Sundays! Yay! ), while the other enjoyed the quiet of the garden. 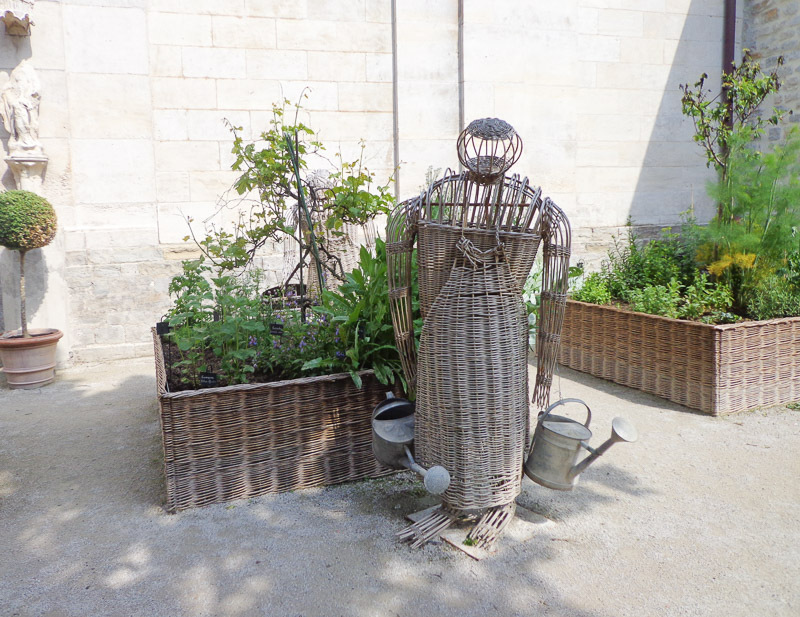 We relaxed together in the meditative gardens together a few minutes more, and then found plat du jour at a restaurant nearby. Mark could finally eat a little! And then we made our way to the castle, also free on Sundays. By now, the sun had disappeared and it was cold and blustery again. 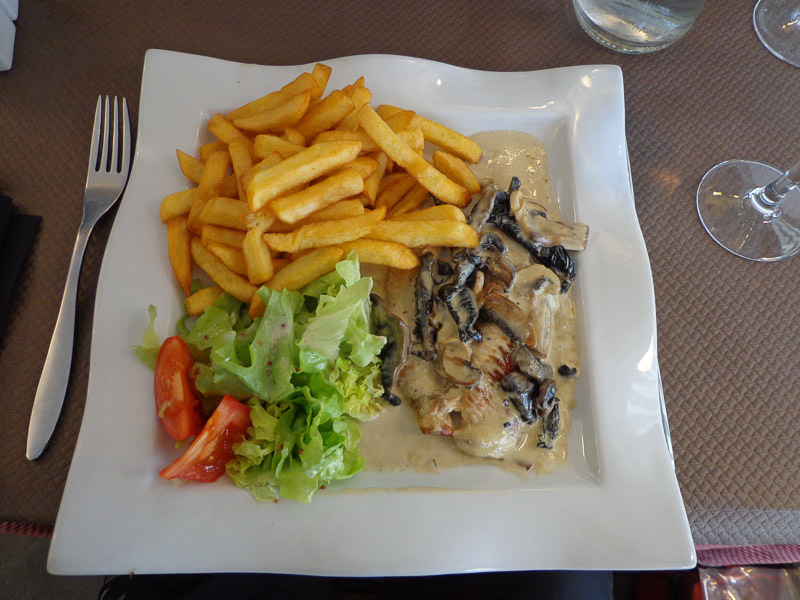 Plat du jour – Yum! We sweet-talked the museum employees into letting us store our loaded bicycles near the front desk so that we could tour the museum together. Thanks, museum staff! Unfortunately, the part we were most interested in, the architecture of the castle, housed in the basement, was closed due to flooding. Oh well. At least we didn’t have to pay. We rolled our bikes out of the castle, bounced and jounced along the cobbles out of the fortified old town, and then coasted nearly the entire way to the youth hostel near the train station. What a warm welcome we received! They offered us a secure outbuilding in which to lock up our bikes. They have laundry facilities…free! They gave us wifi…free (unlimited, not just for 15 minutes)! They gave us continental breakfast…free, even though B&B isn’t in their name! 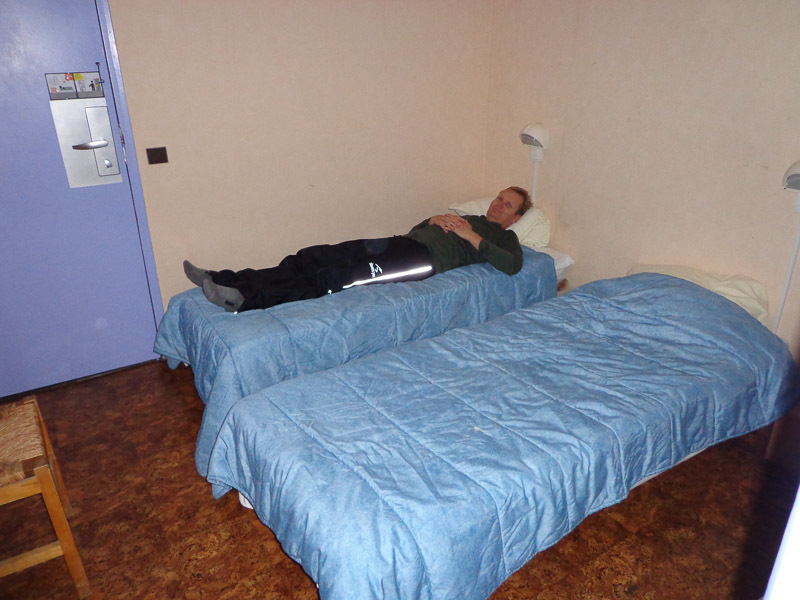 And free bedding (most youth hostels require you to rent sheets if you don’t have your own)! And the clerk behind the desk spoke excellent English – some of the best we’ve yet encountered! We went up to our room, and we continued to be pleasantly surprised. The room was probably twice the size of our motel room of the previous night. And cleaner. And cheaper! (45€, rather than 55€). It was a revelation. We will ALWAYS try for a youth hostel before any other paid accommodations (and we’ll place the call ourselves rather than rely on somebody else to call on our behalf). 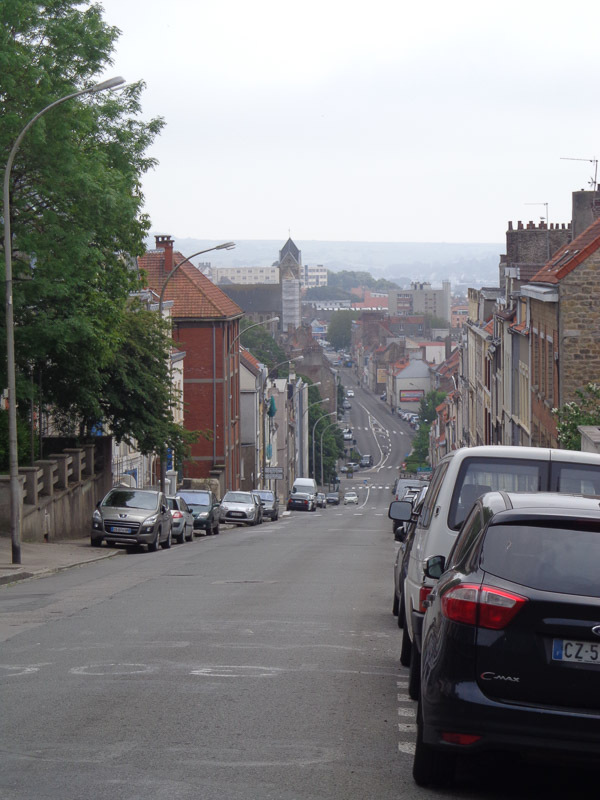 We spent two more days in Boulogne, not seeing the sites, but doing laundry, grocery shopping, working on the blog, taking care of other errands, resting. And staying warm and dry. 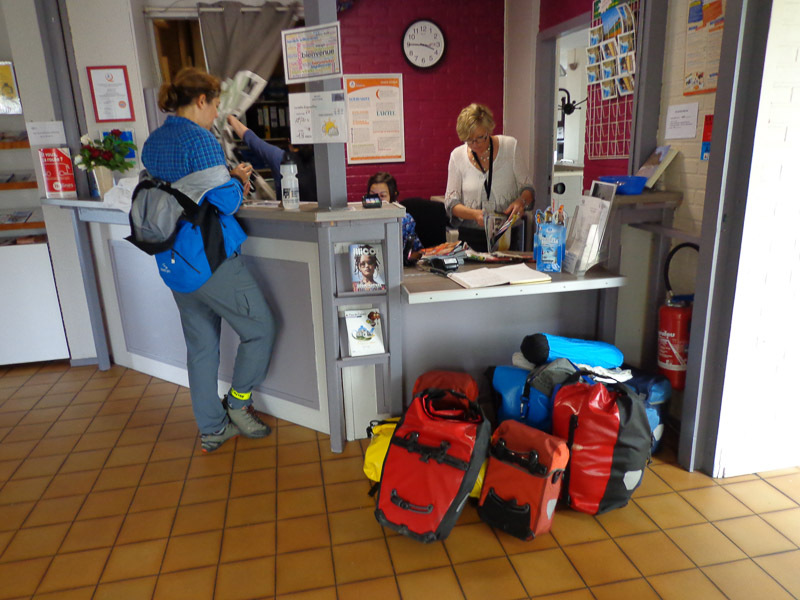 Thank you, all of the wonderful staff at the youth hostel in Boulogne-sur-mer! Is Mark Ok now ?? He is certainly lucky having you ,Julie, in his life to share this wonderful adventure. This “attitude” you have been experiencing in France is something we found was quite prevalent while we travelled there. Maybe it is just French ?? I do look back at the wonderful hospitality we got from Americans while in California when we met you Mark. Keep having a wonderful journey both of you . Thanks Chris and Julie! Mark is doing very well now, and (luckily!) that has been our only brush with illness so far. I have to say that this surly TI office employee in Boulogne-sur-Mer is really the only time we experienced such un-helpfullness, in France or otherwise. He was definitely the exception to the rule. Finding people who speak English is a different story – but, we are in their country, so it’s unreasonable for us to expect them to speak our language. Even so, it is always very appreciated when they do! And very happily for us, the further north we’ve traveled, the more English everybody speaks. Mark is feeling much better. In fact, neither of us has been sick at all except for that one bout of tummy distress, which (luckily!) was short-lived. I hope you’re having a grand time on your trip and that you’re enjoying excellent weather! Glad Mark is feeling better! You two sure have grit!! Watched the Tour de France riders pedaling up a mountain in a hail storm yesterday, and wondered, When does summer come to Europe? Summer has finally arrived to northern Europe in the last week! Yay!